Qualified chef and luxury catering firm owner Bill Rini shares a selection of the company's exquisite contract menu offerings. STRONGSVILLE, OHIO, UNITED STATES, February 20, 2019 /EINPresswire.com/ -- Established in 1994 and based in the attractive Cuyahoga County suburb of Strongsville, just 20 miles from Cleveland, A Taste of Excellence Catering is widely regarded for its luxury dining in and around northeastern Ohio. Alongside weddings, anniversaries, retirement parties, birthdays, baptisms, bar mitzvahs, and more, the luxury catering business also provides an exquisite range of contract menu offerings, incorporating Italian, Mexican, and Middle Eastern cuisines among others, several of which owner Bill Rini is keen to showcase. "From local cuisine to dishes inspired by the Middle East and Asia, we offer contract catering options which feature flavors and culinary styles from right around the globe," explains Ohio native Rini. These, he says, include BuonGiorno Italian Cafe, Acapulco Fresh Mexican Cuisine, Alakazzam Middle Eastern Cuisine, and Ginger Roots Stir Fry. "BuonGiorno Italian Cafe," Rini explains, "features a selection of true Italian favorites, while Acapulco Fresh Mexican Cuisine allows guests to create their favorite dishes from south of the border." "Alakazzam Middle Eastern Cuisine, meanwhile," he continues, "incorporates freshly made dishes with a focus on healthy eating, inspired by Middle Eastern cooking which includes zesty and robust flavors with each bite." Bill Rini also goes on to explain that Ginger Roots Stir Fry—inspired by flavors predominantly from Southeast Asia—allows guests to create their own favorite stir-fries from 'bountiful vegetables, noodles, and sauce selections' specially tailored by the qualified chef and his team to create the perfect mix. Closer to home, A Taste of Excellence Catering also offers The Clevelander Grill, featuring USDA Choice aged beef. "Our USDA Choice aged steaks and chops are cut fresh daily," adds Rini, "and each of our burgers is hand pressed as part of our commitment to upscale corporate, cultural, and educational campus dining." Additional less regionally-focused contract catering menu options also available from A Taste of Excellence include Rise and Shine Breakfast, Healthy Balance, Fresh-N-Crisp Salad Factory, and 'It's a Wrap' Subs and Sandwiches. "Our commitment to excellence allows us to provide numerous varied and always delicious options for any contract dining program," suggests Rini. "What's more, our fresh menu concepts give traditional contract catering a completely new twist, much to the delight of our clients and their guests," he adds, wrapping up. 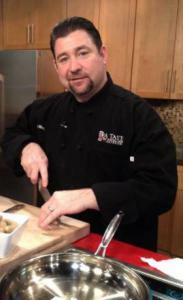 To learn more about Bill Rini and A Taste of Excellence, or for more information on the luxury catering firm's contract catering options, please head to http://www.taste-food.com/contract-catering/.